Again if you haven't already done so, create a new workbook and PowerPivot data model, and import the following tables: tblCentre, tblCentreType, tblPos, tblStore, tblTransaction. Call your new table Categories. Resist the temptation, however, to link this to any other table - it should stand alone! 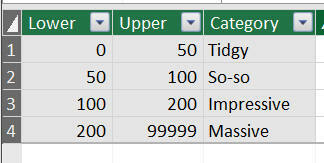 The column should show for each centre the name of the category where the centre's number of units is less than the upper threshold for the cateogry, but also greater than or equal to the lower. This must be a calculated column, not a calculated field! The biggest sales take place in So-so sized shopping centres. Save your workbook as Rename that function, and close it down.